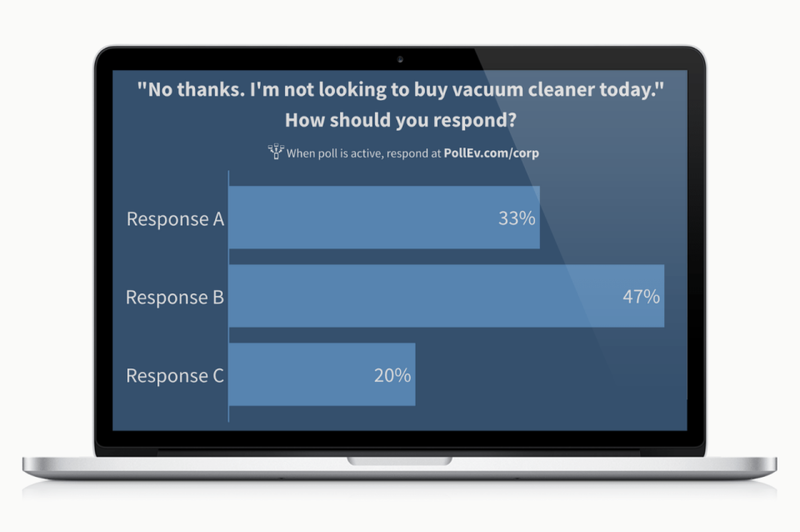 Poll Everywhere transforms one-way presentations into a lively conversation with the entire room. Using the smartphones and devices people carry every day, participants can submit live responses to your polls and activities. You can create and present multiple choice, Q&A, word clouds, rank order, trivia, and more with our web app, mobile presenter app, or through our slide-ware integrations: PowerPoint, Google Slides, or Keynote. Poll Everywhere Reviews Recently Reviewed! Pros: I have used Poll Everywhere for as long as I can remember. As a university professor with large classes, I find it one of the most effective ways to keep students engaged, attentive and on time. It's growing features over the years are also helpful. Cons: Not truly any cons I can think of off the top of my head...there customer service is not perfect, but I have always come to the answer I need. Pros: Poll Everywhere is easy to use from both the instructor and the student facing sides of the software. We desperately needed to find a solution to get real-time survey results in the classroom without making students pay for clicker technology they would ultimately toss away. Poll Everywhere is that solution! Cons: This is not a complaint about the software itself, but rather the pricing. Poll everywhere is more expensive for a tool that is not very robust. If you're looking for simplicity, than this tool is perfect. Pros: I have used Poll Everywhere in the past in college for classroom participation and thought it was great. However, more recently in my career we have used it at conferences I have been to that we have helped put on and it is a seamless way to do voting/ratings allowing people to be honest and anonymous. Cons: I don't have super extensive involvement and have not dealt with customer service, but always excellent in my limited experience. Overall: We used at a conference we recently co-hosted and will definitely be using again in the future. Pros: Using Poll Everywhere is a great way to make PowerPoint and other classroom/conference room style presentations more engaging and interactive. There are several fun and unique ways to have audience members or participants be more involved with the presentation through multiple choice and open-ended questions. Cons: For the participant unfamiliar with Poll Everywhere, it can be a bit confusing to use the system via a cell phone at first. There are several different numbers/codes that need to be submitted to ensure your responses go to the correct place and are included in the group discussion/responses. However, once the user learns and is logged in, it is easy to catch on. Overall: This tool is really helpful to use whether presenting to students or colleagues. It is free and worth the time and energy to incorporate into a slideshow or presentation. 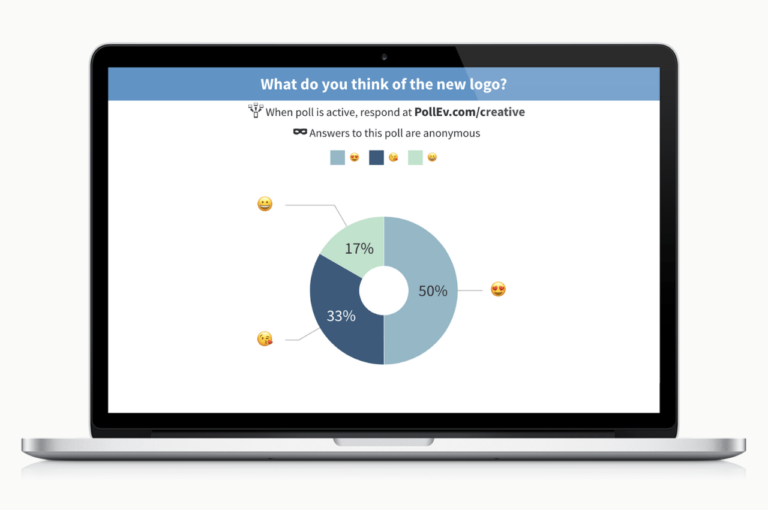 Pros: Poll Everywhere was a big hit when we revealed it during a management development session. The participants loved the idea of responding to an interactive activity and viewing their responses in real-time. I would recommend any professional who does presentations to utilize this tool. It brings a new depth to your presentations! The ability to use the app is so seamless and tech savvy as well. Cons: I would like to see the ability to have more than one multiple choice question displayed at a time. However, it probably wouldn't be as clean and cohesive as possible. Great for polling large audiences, but lacks an intuitive design. Pros: The price is the biggest pro in our mind. The software package is inexpensive to begin with, and they allow for organization-wide use under one account, so everyone can have their own username profile. Beyond the price, the ability to allow respondents to text in their poll choices is really fantastic. Users don't need anything other than a web-enabled device or cell phone to take part in the polls. This makes it very easy to get responses from an audience that may be a mix of novice and experienced tech users. The types of questions you can choose from (multiple choice, free text, etc.) is pretty standard, but the way you can view the responses is really impressive. For example, you can make real-time word clouds from the audiences responses (and, yes, you can filter our swear words!). Cons: We've found that the program itself lacks quite a bit of intuitive design (you really have to hunt around for the features to edit your polls) and the functionality is quite limited. Pros: Customer Service has advanced into websites and social media in this modern day and age. It is also easier to receive customer feedback via online. One way to determine customer feedback is through polls. Poll Everywhere allows our team to determine various feedback. Since responses can be collected through text or Twitter, we are able to reach many customers. This polls are then submitted to our analyst or then presented during meetings. 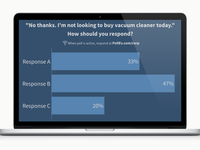 Poll everywhere is a great tool for companies within our industry. Cons: Customization is oftentimes difficult but it is tolerable since what matters is the poll. It was a great tool to keep listeners engaged during a presentation. Pros: Users do not need to do any prep work before a presentation in order to participate in the polls. There are tons of different options for types of polls. You can easily keep people engaged with a new question or poll every slide. Cons: It was not as easy to customize as I would have liked. You have to pay to customize and even when I paid they did not have our branded company colors. It was also a little touchy when you try to upload pictures as the background. It just takes a lot of work but eventually, I was able to customize the product and have a great presentation. The only other issue I had was it gets a little "iffy" when you have multiple people trying to give the presentation from different computers when we were not with each other. At one point I had to control the slideshow via Skype while watching my partner give the presentation in another state because he was unable to activate/deactivate the polls. Overall: Portable software to enhance a presentation and engage a wide audience! Poll Everywhere is a great tool to get immediate feedback from our audience. 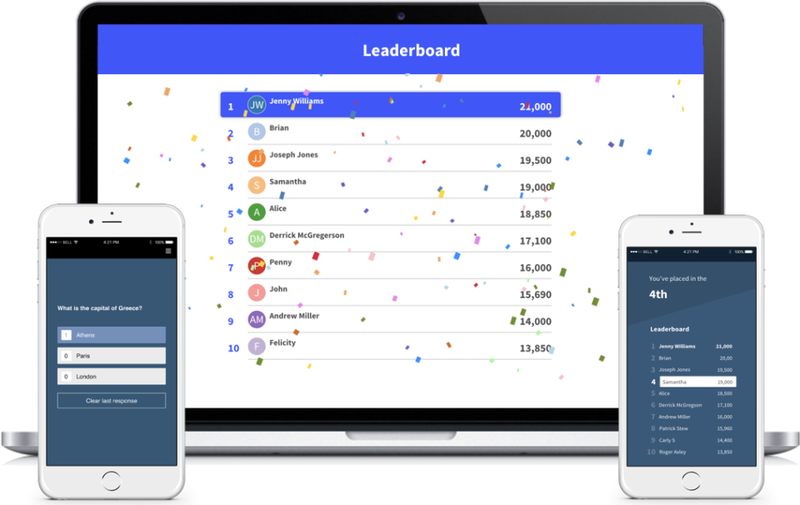 Pros: Poll Everywhere is a fun, interactive way to get feedback from your audience or class. I enjoy using it to excite the audience or even just allow them to give real-time feedback. It's a great tool to enhance your presentation. Simply show them the number, and they can text back their answers to appear on your screen. This integrates well with Microsoft Powerpoint. Cons: Free does not allow for you to delete certain responses, while the paid version does. Also, it only integrates with a web browser or PowerPoint. However, it's still the best product I've found to poll your audience. Pros: Lately, my professors have gotten into the habit of using Poll Everywhere to conduct an interactive lecture. By showing the link on the screen, every student can participate quickly in polling during the class. It's simple and easy to use, and also easy to set up. Instead of having students buy clickers, this is an awesome, free alternative to get students engaged. Cons: Some of the modes of presenting the data results are very hard to read and understand. There needs to be improvement to the options of presenting the data. Pros: Live polling that requires only a cell phone from users and easy set-up on the front-end by the administrator is fantastic. I liked the ease of set-up and the fact that I never encountered any glitches while using this software. Cons: The free plan (which I used) only allowed for 1 user, so our group had to create a master account that we could all access. Overall: I have used Poll Everywhere in live presentations to gauge audience feedback in an anonymous fashion. Without this resource, due to the nature of topics we were interested in seeking feedback around, we feared we might not get honest responses. Poll Everywhere allowed participants to safely provide honest feedback with a simple text from their cell phones that could be displayed in aggregate on a projected screen in our presentation space. Pros: Program was very wasy for the user. We recently used this in a large meeting and it was really nice to be able to see same time results. Cons: Once the answer is revealed the user has a chance to change their answer which may skew the results. Pros: I really love how you can see results real time and helps make meetings much more engaging. The program also works very well with almost no lag time. Cons: My one complaint is the pricing. While they do offer a "Free" version if you have a lot of participants that not going to work for you. I think the pricing is a bit steep and think they could offer some better options. Overall: Overall, we have loved it, and have no complaints about it. Its the only polling software we use. Pros: We have used several times for conferences and events. It worked as expected and was pretty easy to use. Customer service, when needed, was very good. Cons: We have one or two poll questions that did not display but it is hard to say who's fault this was -- the operator of the system! Great for teachers, professors, training sessions etc. Pros: Poll Everywhere does a great job of keeping people (whether that be students or people in a training session or meeting active and engaged). You really can't ask for much more than that. Cons: Not really too many cons I can think of here...it would be nice if the free version offered deletion, but not really a huge issue for a small scale trainings I have used it for. Overall: Keep your audience active, engaged and attentive. Pros: 1. Easy to use, friendly and simple User Interface. 2. Preferable for teachers to set up quick quizzes and test in classes. 3. Appreciate the part that there is a variety of different formats for answers. Cons: 1. Not much of the features are provided with the price of the app. 2. Also, being a student, I cannot afford the paid subscription every semester. Pros: Simple and fast for audiences to engage at a conference. Cons: The download experience for each user is different to get set up, but once set up it is streamlined. Overall: Large audiences need to feel connected to the presenter, and this software app makes that easy. Pros: I like the interactive ability this gives me when presenting. I am always looking for ways to get the audience more involved. The audience is already on their phones so why not use them to get into the presentation. Cons: Everytime I use a new computer, I have to download the program. Overall: I like the ease of setting up questions. I also like the ability to look at statistics afterwards. I ran into trouble the first time I used Poll anywhere though. I had it downloaded on my computer but the computer I used didn't have it. When I arrived to do my presentation, the hosts had the computer all set up and I had to E-mail the presentation to myself quickly. I got all the way into the presentation and then realized that the poll didn't work. The slides where there, but there was no interaction. Pros: What I like most about this software is that if I am giving a public speech or presentation, I am able to engage the audience in a meaningful way, one of which has the potential to change the very course of the presentation itself. This is an incredibly novel thing. Cons: What I don't like about this software is its inability to do more complex polling/experimental designs. That is, I wish I were able to set up different experimental conditions to poll the audience with in order to make more complex points rather than just simple polls. Overall: Overall Poll Everywhere is a phenomenal tool that allows presenters and speakers to engage the ENTIRE audience in a very novel way. Pros: Poll Everywhere is easy to use, allows for multiple polls to be taken, helps audiences see responses in real-time, and keeps presentations interactive. Cons: On one occasion there were some challenges in integrating it with Mac programs. This wasn't Poll Everywhere's issue, but Mac's. Pros: PollEV is fantastic for setting up quick surveys to use in professional developments that I use in my school. I love that it gives realtime results and allows you to view the data in different ways. Cons: Very limited functionality for the free version of the product. Pros: Poll Everywhere is easy to use and eliminates the need for costly remotes/clickers. Users can access the polls and respond via smartphone. I have used Poll Everywhere as a student and also in a professional setting and have never had an issue with it. Results are instant and displayed in a chart which can be easily interpreted. Cons: For individuals who may not have access to a smart phone or prefer not to use personal electronics for this type of use, data collection may be skewed. Pros: I like that this app allows for students to be counted and surveyed without the use of an iClicker. Instructor can easily ask a question for students to answer in real time. I also love how you can see how the precentage of the class answered. Cons: Logging in can be tricky and use through data (when you dont have wifi) is confusing to navigate. 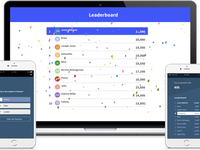 Overall: Poll Everywhere is great for teachers and students. -As a creator, Poll everywhere is simple and straightforward despite how complicated it may seem. Fun Way for Employee Engagement! Pros: When used in a large meetings, especially in Town Halls, the results are real time, and can be shown to the audience. It is a fun way to get the audience engaged! Cons: It is not user friendly when it comes to publishing your polls. Had to go to several avenues before learning how to publish them correctly. Love it and you will also! Comments: Used it in the classroom and via twitter to get some polling done in a pinch, great software and works like a dream. Give it a shot! Poll Everywhere makes my trainings more exciting! Pros: I like Poll Everywhere because it's very easy to use and by using Poll Everywhere, my presentations and trainings are much more exciting! Overall: Since I've started including Poll Everywhere, the attendees and students in my class really engage in what they're learning. Best polling application for the classroom! Pros: The free limit on responses is exactly what I need for a community college classroom setting, so I don't have to purchase anything to use this product. Cons: There's the possibility that if my classes increased, I wouldn't be able to use this for free. I don't really have any complaints about it, except that sometimes it's hard to tell if I've allowed access to the poll. The button color changes to a slightly different shade, which isn't always obvious that responses can be submitted.